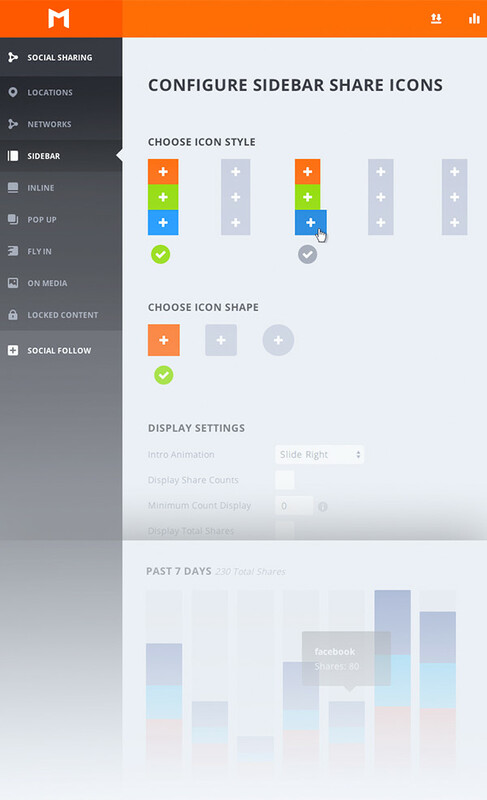 Last month we gave you a tiny little peek at our upcoming Social Sharing Plugin, Monarch. Since then, we have continued the design process as we explore ways to make a social sharing plugin that is both simple and comprehensive. Now that development on Monarch has begun to evolve, I am excited to give you a more in-depth look at what we are building. As we mentioned in the first Monarch sneak peek, social sharing is so much more than a sticky sidebar of social links. Monarch will give your visitors the ability to share and follow anywhere on your site. Whether it’s through a sticky sidebar, an inline content block, widget area, a pop-up or one of our various other integration areas. We have a ton of different ideas around where social media can be integrated into your site to get you more shares. Not only are we working on creating beautiful front-end results, we are also spending a lot of time making sure the setup experience is enjoyable as well. The Monarch dashboard will be the place for you to add new sharing or following icons to your website, configure them, and even obtain stats about how well Monarch is effecting your website’s social media presence. We hope that this new backend options panel will serve as a framework for even more great plugins in the future. Select your social sharing locations. Customize the look and feel of your icons and even check your stats! Where can I like this post? How about Facebook Likes and +1 buttons, will they be integrated or is this only for the share buttons ? The plugin will focus on sharing buttons, but integrating native sharing buttons is something we will likely add in the future. I currently use Flare Pro, and love it as it offers pretty much all the customization features you mention here, both front-end and back-end. This does look nice, though, and I may test it out on properties I manage. One question – the biggest bug-bear for any social sharing plugin is the load it can add, and the subsequent issues that can cause. For example, if a network like Twitter or Facebook has server issues, that impacts site load because the sharing button is impacted. Similarly, if Filament Apps (the developers of Flare) have an issue with their servers, that impacts Flare (since it’s hosted by Filament). Do you guys have any plans to “safeguard” site impact if social platforms have issues? This comes from using the network’s API to check for your social share or follow count. We will have an option to enabled/disable counts. If disabled, there will be no need to connect to the network’s server. Cool, thanks. Will there also be an option to cache / pre-load counts, so if someone wants to show share counts, they still can? Or would this not make too much sense from a dev point of view? The one I use allows a count to be manually entered, but it’s an either/or choice. I’d love for there to be the option for an automatic count that if it fails within a set amount of time, the manual count would be shown instead. I’m already using a really cool social media counter and connect plugin that totals your following across your selected social networks. I like the fact that I can customise the text for my total followers, and because of its relevance to what I’m doing I use the text “People Inspired”. The social look feature is a great idea. I definitely need that plugin! Man that is AWESOME! Can’t wait to install it on my websites! Hi Nick. Lately I have seen the need to incorporate a social plugin that doesn’t infringe the integrity of my website design. I’ve been about to buy one of the Code Canyon plugins, but I think I’d rather wait a little longer, after seeing the slick design, features and versatility of Monarch. I am left with mouth open on the excellent work of the ET team and how much this will mean to my business. I wish you well on this project to get started with Monarch soon. Again, looks good with a lot of beautiful options. As I mentions earlier, I hope that there won’t be a conflict with blurb icons when you use an iPad or a small screen. But despite all, I will one of the first users when released. Looks awesome. What kind of mobile share support can we expect? Specifically, if I see correctly there will be a floating share button option. How will they relocate when on mobile like iphones? 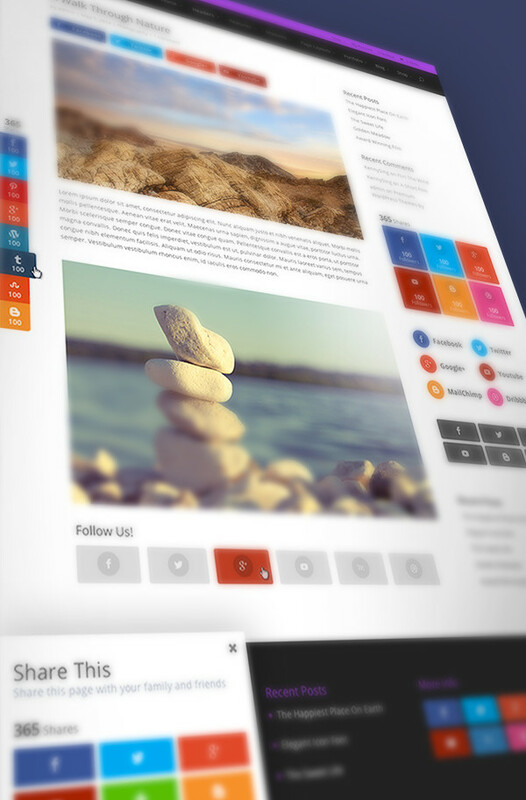 We plan to have responsive styles for all variations. In the case of floating sidebarss, then would re-locate to the bottom of the screen in a slide-in toggle. Your designs are again stunning. You keep surprising me Nick. It looks awesome on the graphics! I can honestly say, purchasing a lifetime membership has been my best online purchase ever. Thank you for all of your hard work. Divi is beautiful, and this looks amazing. You guys rock! Love you guys. Was just thinking about a social sharing plugin for a client, and then this hits my inbox. Great stuff, Nick! As usual, you guys are delivering fantastic value! Very excited you are going to provide this, it looks magnitudes better than many others out there. I am sure it will have your usual top notch functionality. Cannot wait! Looks stunning. Looking forward to taking Monarch for a test flight. 1) Will we be able to use Monarch to send visitors to our social channels? 2) Will there be a shortcode and, if so, will we be able to specify a URL to share? Can’t wait for Monarch to spread her wings and take her maiden flight. I can´t wait to test this new plugin and to use it. It looks very great. Looks absolutely fantastic. Elegant is really a rising star in the WordPress world and I’m so happy as a customer to be along for the ride! I am impressed again Elegant Themes. I am loving the Divi and now this. I cannot wait. Way to go. Awesome! I can’t wait to dig into this when it comes out. I’ve experimented a lot with sharing plugins and I see a lot of potential in this one to increase shares :). Plus, Flare (what i’m using now) is no longer being updated. Yet again I am bewildered and amazed at the same time at how you manage combine that level of design and functionality at the same time. Hats off! It might simply be the best social sharing plugin yet! Thanks for your dedication for creating highest quality products! It looks absolutely great. I might wanna compare functionalities with addthis. Wow, that looks brilliant. I really hope you include soundcloud as a social option. The Monarch plugin looks really awesome. Beautiful designed. I am really looking forward to to try it! A few days ago, I decided to become a lifetime member. Why? Because I have faith in Nick & the entire Elegant Themes team to not only deliver great themes, but great plugins as well as great advice. I hope that Monarch delivered because I have tried many social media tools and they haven’t been what they ought to be. Monarch will be a welcome addition to ask my sites. Thanks Nick, looking forward to next month. Thanks Sri. I can promise you that the products we release will only get better and better! Please tell me this will be fully compatible with Woocommerce and allow us to have social share buttons on our individual products…pretty please. A 2nd request for Woocommerce compatibility!!! I am just researching ecommerce and looking for the most cost effective solution. Woocommerce may be the way I go….especially if monarch is available. 3d Cart is a 2nd contender. A James Bond kind of sleek UI! I sanctioned other social plugins to wait for Elegant Monarch. Hope there would be option for facebook like box. Thank you very much and I’m delighted to be in the community. Hi, I see a lot of new social sharing stuff on the internet now. Is this also do things like giving away something like a e-book or pdf for them to first click the share button. And after that they get there gift? YES, it looks like this is the one i need after trying a couple of others that just don’t do the trick or have the styling possibilities i want. Super addition to the ET range of products for great web design. Great value for money as usual….you guys never cease to amaze me. I agree with the previous comments about managing the issues of the speed at which the social media platforms can respond to all these calls to count likes etc. Option to only activate real time counters if needed/wanted would be great. But I feel they pale in comparison to the performance issues of the code used. I have used 2 similar plugins recently, that both claimed to help with page speed performance and I can tell that one really takes it seriously and the other is jamming CSS and Javasript code in-line all over the place and obviously doesn’t. I’d love to see the ability to minify the extra code this plugin creates (all social sharing plugins create extra code like this) and at least the option to have all customisation code in an external file or files rather than in-line with no other option than in-line. Good luck with the remaining milestones before launching, hope it all goes well. Hi John, you could always code your own! I made a counter that just calls twitter & fb, because I noticed almost all plugins call stumble, reddit, pinterest etc. Now the solution is light and clean. check http://www.kristofdevos.com and navigate to a single post if interested. Could you share which ones? I’ve been AB testing between Flare Pro and Ultimate Social Deux Pro, and both have strengths and weaknesses. Interested in the ones from your own experience, cheers! Thanks for the update Nick, I have been looking forward to this plugin! Looks awesome, What kind of social plugin are you guys using on the side of this blog post? We are currently using AddThis on the blog. I’m guessing Monarch won’t have the ugly URLs that seem prevalent with AddThis? Awesome. I am so glad you have started developing plug-ins. I expect this is an area you guys will excel in. There are so many out there but you guys excel when it comes to design and flexibility. Thanks Nick for expanding and providing added benefits to our subscriptions. Muy bueno. Saludos desde España. I am so glad you guys are making this. It’s amazing how many social plugins there are and how they all are not that good. Finally, this one looks SO PROMISING! YAY!!! Can’t wait. You guys rock! Oh man that looks good! Looking forward to it! Can’t wait for this plugin. Will it be released on september? Hoping Monarch loads a bit faster and works just as well on mobile. This plugin has me waiting in anticipation, as it looks like it will solve many needs for client websites.The design looks beautiful! Will be using this plugin IMMEDIATELY on my three sites. Looks great! Hope we don’t have to wait too long for this. I feel like I have been waiting for “Extra” forever. I know it hasn’t been all that long but … How about an “Extra” update? It looks really awesome! ET is the best. I need your urgent input please about fixing a Divi 2.1.2 bug. When using subscription module (and entering the MailChimp API) the designing tool CANNOT be used (it just disappeared). I contacted the support team three weeks ago. They replied that this is known issue and they are going to fix it. If you have opened a ticket, and a bug has been logged, then we will fix the bug as soon as possible. I know we already have some bug fixes for the next maintenance release that focus on the subscription module. Sorry for the delay. Great! Shure will solve some headaches. Can’t wait to see it, but never hurry, better make it proper :-). ShareThis has been all over the place, hope you catch up there. Will life members get Automatic access to this plugin or do we have to make an additional purchase? My head’s about to explode..this looks incredible! This looks fab and just what’s needed! Can’t wait for launch! WOW!! Just what I needed!! Cool! I really can’t wait to install it on my site. If you would add the Russian social network Vkontakte, it will be just perfect. Thank you for all the great work you do in ET! I’m anxious to try it. Some related questions …. Is this blog currently using Monarch, or will it be upgraded to Monarch soon? It would be nice to see it in action as an end user. What other cool plugins are in the queue that we can look forward to? Monarch looks to be more about sharing than supplementing the WP comments. Are there any plans for plugins that are related to the comment system? We aren’t using Monarch yet. Right now are blog uses AddThis. We have a few ideas for plugins, but you’ll have to wait for the Sneak Peeks for more details 😉 Monarch will not be focused on Social Commenting, but this may be something we can explore in the future. Will Monarch also have social commenting? The plugin will be focused solely on Social Sharing, but perhaps social commenting is something else we can look at in the future. Sounds great to me. Look forward to the release and unleashing it in my sites. I’m so glad I upgraded to a developer package! Looking forward to this. Now just need to study how to use the PSD files properly! I can’t wait – This is going to be awesome! Can’t wait! I love how much thought you put into each new thing you build. I’m just playing with Divi for the first time and I have to say, I’m totally impressed. It’s about time someone came up with an intuitive WordPress interface like that. Looks great, do you have a launch date? I’m on the dev package will the plugin be available under this? We don’t have a set launch date, but we are hoping to finish the plugin within a month or so. Looking forward to it! You all do great work. Thank you so much for making it so easy for me to make my clients look great. I can not say more than what others have already said. You are the best! Looks great! Would love to be able to turn this feature on and off per page. This looks amazing. I have to say that I am very impressed with Elegant Themes. Great Themes, Cool Plug-ins and top class support! Looking amazing! Exited about this! It looks great, we are expecting a blog post when its ready guys!!! This looks really nice. I am excited, def a time saver. Very intrigued by the design and can’t wait to see it in action. Will there be any tracking features for this plugin? Any data similar to what AddThis shows users for how often something has been shared? Wow. I’ll be installing this plugin for sure. I’ve been looking for an AddThis alternative. This is Exciting. Looking forward to add this enhancements to my blogs. Is there any Updated ETA on this plugin by any chance ? Nick, I can’t wait! This is going to be awesome!!!! rule #1, don’t ask ETAs! Quick question – will this plugin include social buttons upon image hover (mouseover)? Looks great. Very keen to put Monarch and ET to work in upcoming projects! Same ol’ question Nick. Is there any update on a release date for this plugin sir? I’m signing contracts on a new project in the morning and would love to have this in my arsenal. Would love to get my hands on the plugin as soon as possible. Any updates? Any update on the release of this? It is much needed I have been searching for customisable social sharing options and it is a nightmare! Any update… even vague… would be a help. I almost broke down and upgraded my AddThis account to pro… Any guess when Monarch will be released? Looking forward to use this plugin, seems useful and nice plugin. Any updates on the ETA for this plugin? Thanks! Can’t wait to add it to my quiver! If you look about 90% down this page you will see where Nick responded with a release time for both Monarch and Extra. Monarch should be any day now according to that. Once again you came up with an amazing plugin. It is exactly what I needed, on pretty much all my sites. When I finished installing it and setting it up, I deactivated 4 other social plugins. FOUR. Complete, extremely easy to use, beautiful and smart. Thank you so much. It looks great! I have installed Sumome for the flag, but these looks better, and more customizable. Will give it a try. Any ideas what I have to do to use it in Germany? We have those data protection law … and I guess this requires some attention. I definitely want to use it instead of my current solution. I would like to know if your plugin support Facebook Like, just like only, not Fb Share. Right now it is just share, not like.